While we wait for Saturday morning, 1 April 2017, when we'll learn who the overall winners of Gulf Winds Track Club's 42nd annual Springtime 10K, I thought it might be interesting to look back on some of the past winners. I chose the races for the ten years from 2007 to 2016. Those are the most recent years, of course, but those were also the years when I took photos of Springtime. And this was originally supposed to be a slideshow. But somewhere along the line, I decided that although I probably could eventually turn my photos into a video with a nice Beethoven soundtrack, I wouldn't be done with the work till several months after the race. So I abandoned the project. But what should I do with all the photos that I had unearthed from my archives? So I did this. It was always supposed to be a little bit more than a list of the past champions and their pictures, but the photo captions kept trying to grow into a history of the race. As much as I would like to write a history of the last decade of Springtime, that would have taken way more time that I had to spend. I hope you'll enjoy the details that did manage to sneak into the photo captions. 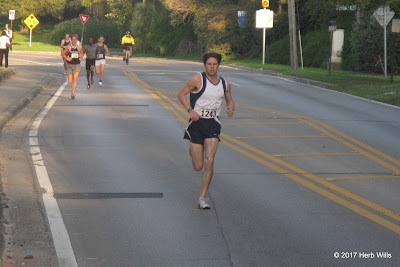 near the end of the second kilometer of the 2007 Springtime 10K. 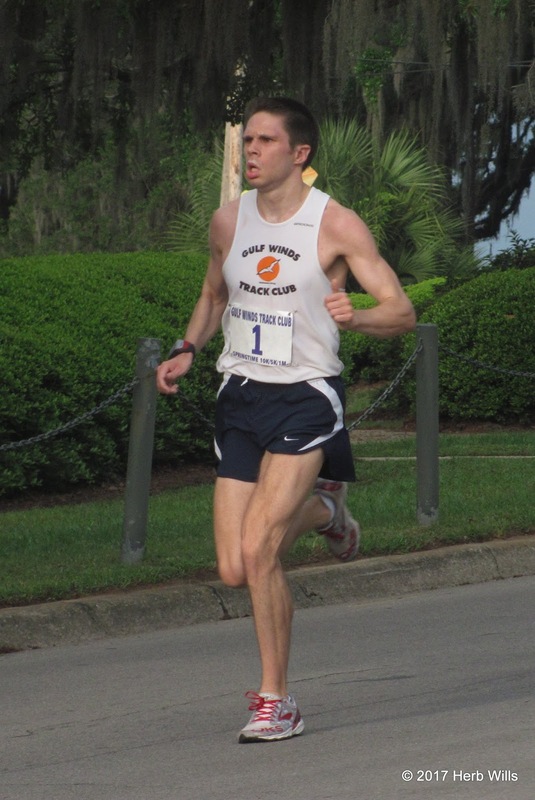 Although Dobson hailed from Jay, Florida he was no stranger to the Capital City's roads, having already won titles at Gulf Winds Track Club's Tallahassee Turkey Trot 15K in 2004 and 2006, as well as the Springtime 10K in 1994 and 1995. In 2007 the Springtime 10K still finished with a one-kilometer circuit of the greenspace bounded by Lafayette, Meridian, Gaines, and Suwannee Streets. 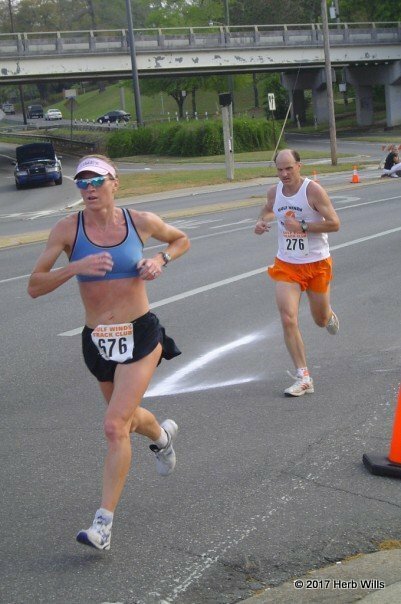 Here, Lara Shaw has just started that final lap. 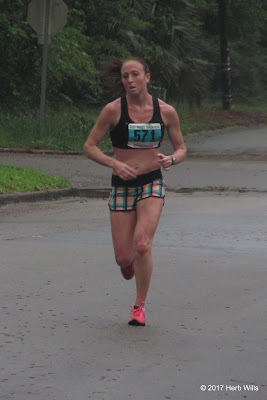 Placing fourteenth overall, Shaw would finish at the top of the women's standings, with Lisa Johnson second in 38:03 and Sheryl Rosen third in 38:52. Remember those names. A graduate assistant on Florida State's track and cross-country coaching staff, Joey Zins won the 33rd annual Springtime 10K by almost 200 meters. 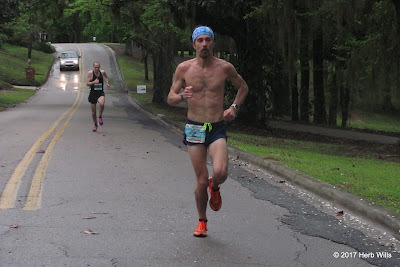 Here he makes the climb up Lafayette Street early in the race, accompanied by Luke Beevor (2nd, 32:33) and Tripp Southerland (3rd, 34:02). In this photo, Sarah Docter-Williams starts the final kilometer of the 2008 race, where she picked up her fourth of four Springtime 10K titles. I won't say it was her last, because she's still running. 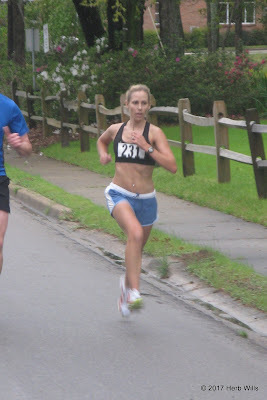 Half a minute back, Lisa Johnson was the women's runner-up. 300 meters from the finish line and 100 meters ahead of his nearest challenger, David Altmaier makes the turn from Gaines Street onto the Suwannee Street homestretch of the 2009 Springtime 10K. 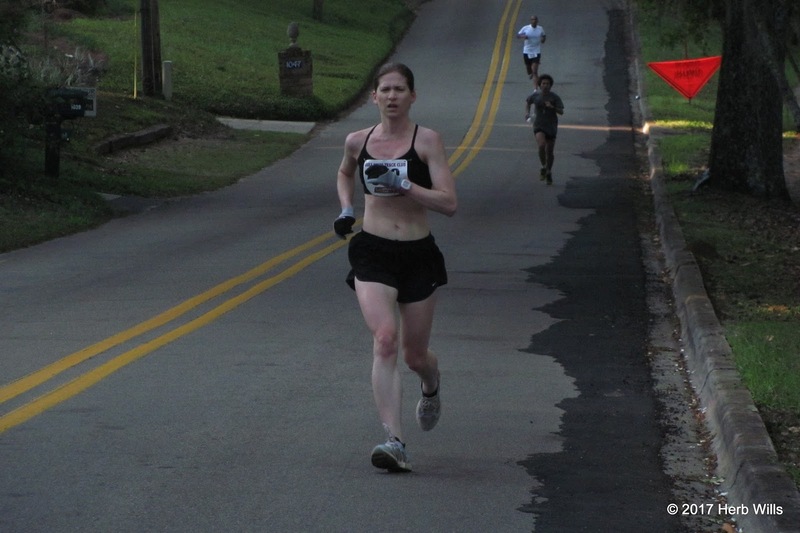 With just over 300 meters to go, women's winner Lisa Johnson is driving toward the finish line of the 2009 Springtime 10K. 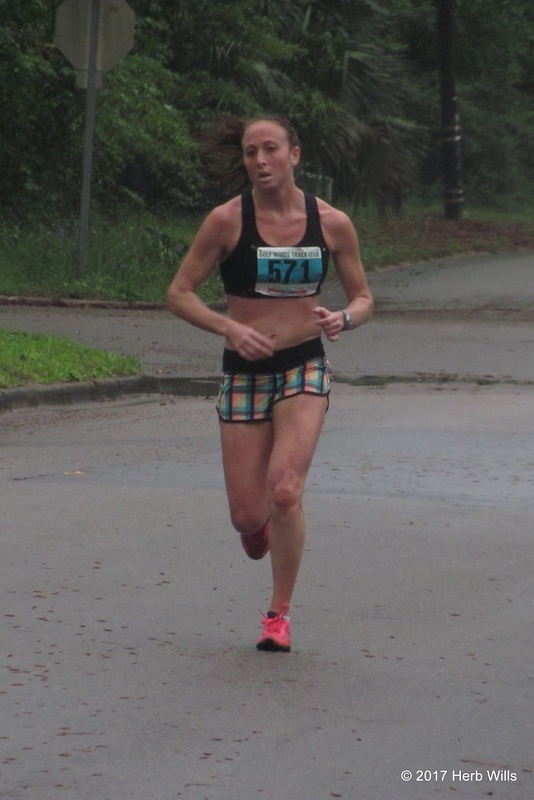 Finishing seventeenth overall, Johnson was followed in the women's standings by runner-up Seeley Gutierrez (31st, 40:49) and third-place Sheryl Rosen (34th, 41:20). 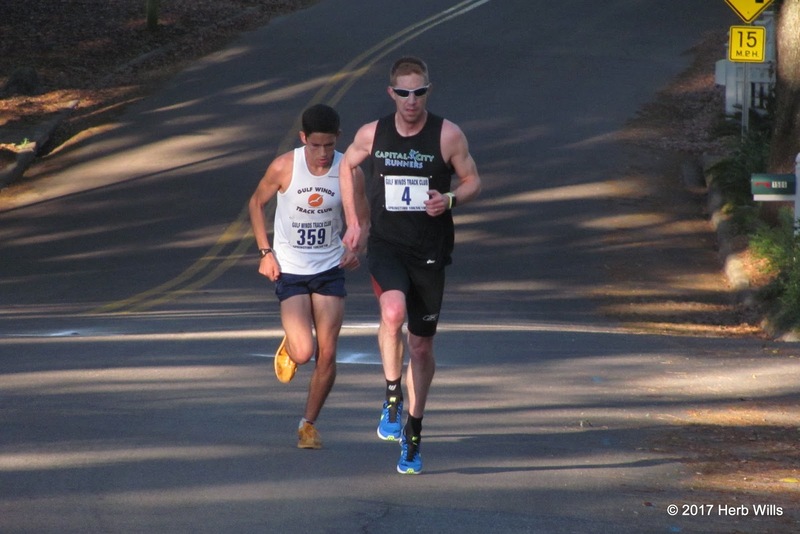 Taking advantage of excellent running weather, Chris Lake cruised the Springtime 10K in 33:09, winning the race for the first time. Nate Kaiser was second in 33:35 and Stephen Cox third in 33:44. 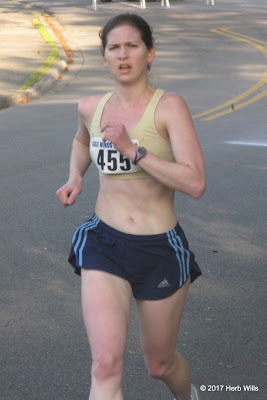 After a few times of featuring high but not at the top of the women's standings at the Springtime 10K, Sheryl Rosen won the women's title at the race in 2010. It was her first Springtime title, but it wouldn't be her last. 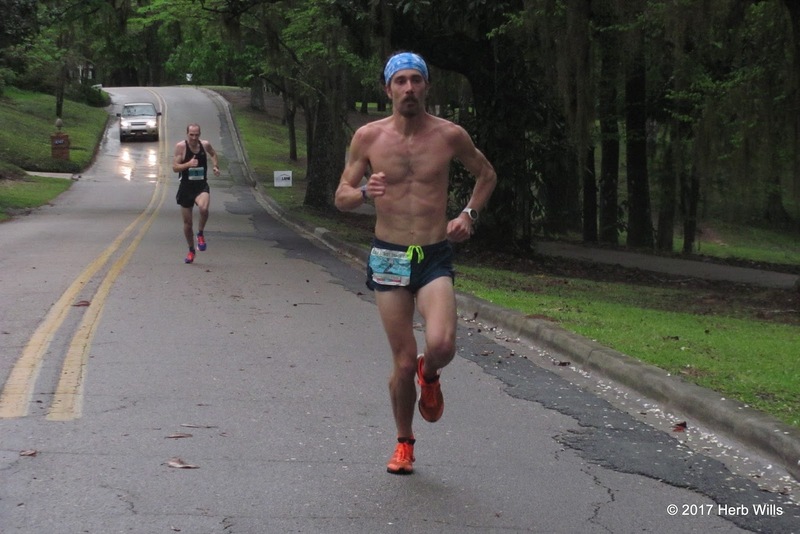 Outrunning three-time Canadian Olympian Kevin Sullivan (2nd, 32:45), Chris Lake won a second-straight Springtime 10K in 2011. Florida State alumna Pasca Cheruiyot posted the fifth-fastest women's time in the first 35 years of the Springtime 10K to win the 2011 race. Not even her FSU coach, Karen Harvey (18th, 37:33) could keep up with her, and had to settle for the women's runner-up spot. 2010 women's champ Sheryl Rosen (36th, 39:03) was third. 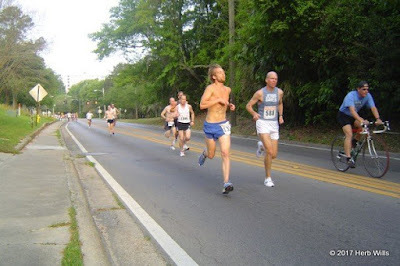 Construction on Cascades Park led to some extreme course changes in 2012, with the race starting south on Monroe Street. In the photo, Chris Lake is speeding down a hill on Gaines Street with about half a kilometer left in the race. 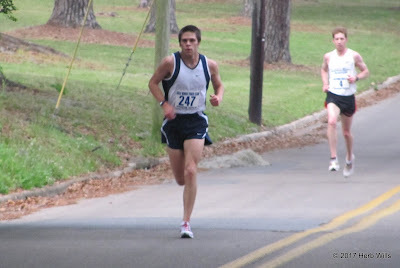 Lake picked up his third straight Springtime 10K title that day. Over 200 meters back Stephen Cox was runner-up in 34:18. 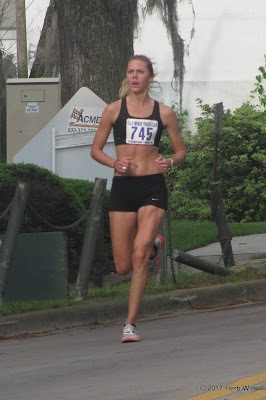 Florida State graduate assistant track coach Lindsay Zeiler with half a kilomteter to go in the 2012 Springtime 10K. For the first two kilometers of the race it was Zeiler and 2010 women's champion Sheryl Rosen in front of the women's field, but after that it was all Zeiler. Rosen (13th, 38:35) took second in the women's competition. Here, near the halfway point of the 2013 Springtime 10K, Stan Linton shadows leader Kevin Sullivan. Sullivan lost his shadow soon afterwards, going on to win the race by 250 meters. 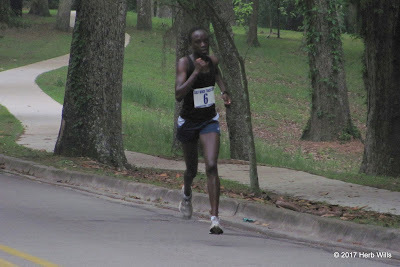 Linton, second in 32:32, would go on to compete for Florida State University. Running in Capital City Runners colors, Stefanie Slekis took the women's 10K title at the 38th annual Springtime race. 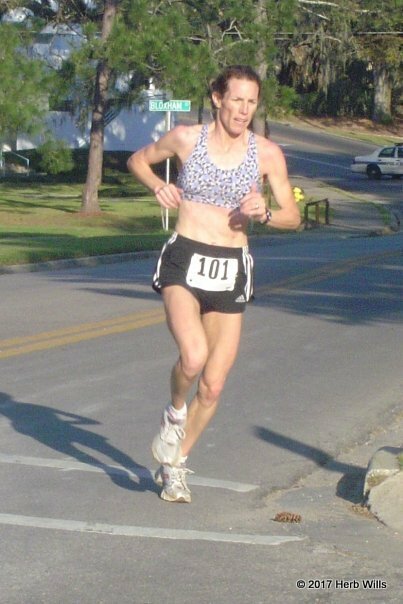 2010 champ Sheryl Rosen was runner-up on the women's side, placing 18th overall in 37:11. 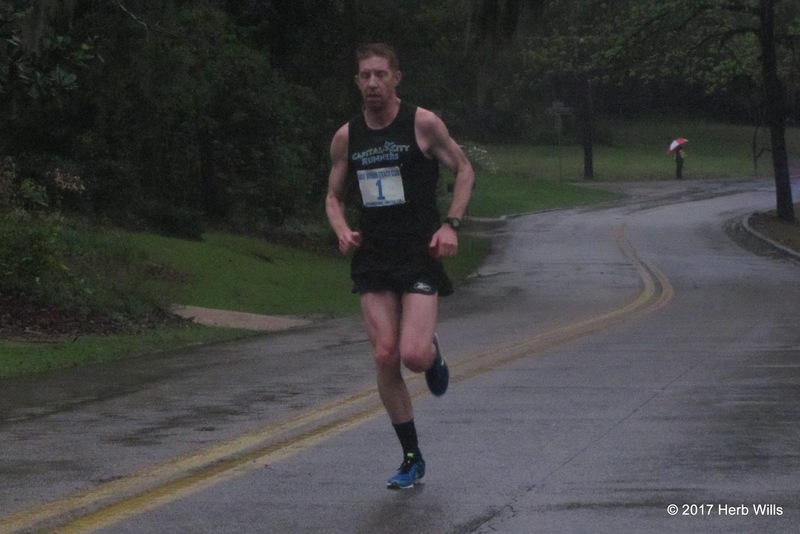 On rain-soaked streets, Kevin Sullivan won his second Springtime 10K title, this time by more than 400 meters. Three-time Springtime winner Chris Lake was second in 33:37. Remember Seeley Gutierrez, women's runner-up in the 2009 race? 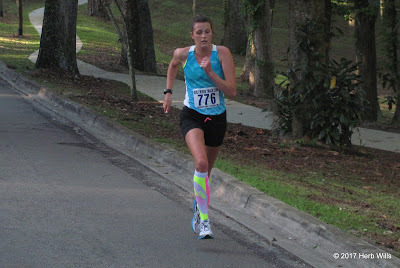 Gutierrez returned in 2014 to claim the Springtime 10K women's title. In spite of the wet conditions, it was her fastest Springtime performance yet. Stephen Cox figured in the top ten of quite a few runnings of the Springtime 10K, but in 2015 he won the race after chasing down three-time champion Chris Lake. Lake was runner-up in 33:10. 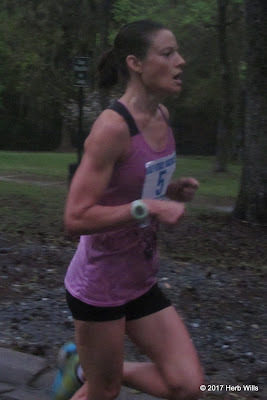 Finishing 200 meters ahead of the next woman, Sheryl Rosen picked up her second Springtime 10K women's title in the 2015 race. Here's a photo of Nate Kaiser in pursuit of Springtime 10K leader Roger Schmidt with a kilometer to go in the 2016 race. 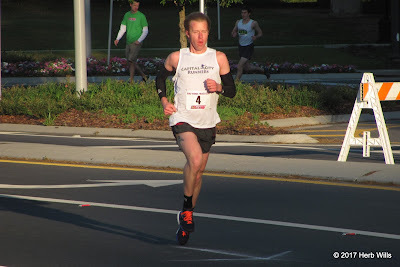 Schmidt couldn't be caught that morning, though, and won the 41st annual Springtime 10K. Kaiser was second in 34:16. Adriana Piekarewicz took the lead in the women's field two-and-a-half kilometers into the 2016 Springtime 10K and never had to look back after that. The Florida State alumna went on to win the women's title by more than 300 meters. Two-time Springtime champ Sheryl Rosen took second in 40:30 and Alyson Churchill was third in 40:38. At Lincoln High School's Jimmy Everett Track on Wednesday afternoon, 29 March 2017, track and field had returned to Tallahassee, Florida for the middle school students of Leon County Schools. True, there had been a relay meet at Chiles High the previous week, but this was the first real track meet of the year. It was right there in the name of the event--"Leon County Schools Middle School Track Meet #1." Number one. How could you doubt that it was the first? Competition opened with the girls' 1600 meter run. Swift Creek Middle School eighth-grader Lexi Gray won the four-lap event, posting a 6:08.18 in the first of two sections of the race. Leah Holman of Deerlake, a sixth-grader, ran 6:16.29 behind Gray in section one to take second. Swift Creek sixth-grader Paige Churchill ran 6:19.64 in the second section, placing third. The boys' 1600 followed. Jordan Guice, a Fairview eighth-grader, opened his season with a win, running 5:15.32 in section two of the race. Deerlake seventh-grader Zackary Levy was second, running 5:23.83 in section one. Also racing in section one, Cobb eighth-grader Campbell Hart placed third in 5:26.30. After the 1600 the hurdle crew went to work, setting up the barriers for the girls 100-meter hurdles. Montford eighth-grader Eva Cotton posted a 19.33 in the second section to win the event. Back on the track after the 1600, Paige Churchill took second for Swift Creek, running 20.21 in section two. Kately Kopacz of Deerlake, a sixth-grader, ran 20.97 in section one to take third. Montford eighth-grader Jalen Herring scored a big win in the boys' 100-meter hurdles, going 14.48 in section three of that event. Trailing Herring in section three, eighth-grader Zakyle Bush of Fairview took second in 16.20. Swift Creek's Alex Silvaroli went 16.65 in section two for third. The action remained on the straightaway as the hurdles were cleared from the track for the girls' 100-meter dash. Khori Lewis of Fairview placed first in section three and won the event in 13.77. Raa eighth-grader and cross-country runner Amaya Jones took second, running 13.89 in section three. Griffin sixth-grader and Deerlake eighth-grader Keoni Knight tied for third, Thomas running 13.92 in section one and Knight posting the same time in section three. There were four sections of the boys' 100-meter dash. Swift Creek eighth-grader Galen Johnson raced in the fourth section and won the event, clocking 11.51. Also competing in section four, Deerlake eighth-grader Savion Knight took section in 12.10. Seventh-grader Chase Gillespie took third for Montford, running 12.15 in section two. Seventh-grader Jasmine Raynor went 65.87 in the girls' 400-meter dash to get the win for Fairview. Gabrielle O'Sullivan of Deerlake took second in the event, running 67.87. Montford seventh-grader Lauren Wilkey placed third with a 68.28. Kaseem Ibraheem-Washington won the boys' 400 for Cobb with a 56.05. Swift Creek eighth-grader Rajauhn Sancho was runner-up in 57.26, and Fairview eighth-grader Darrien Lawrence grabbed third in 58.35. The Cobb girls won the 4 x 100-meter relay, carrying the baton around the track in 53.41. The Raa girls were second in the relay with a 54.35, and the Fairview girls took third in 54.65. Montford edged Nims in the boys' 4 x 100-meter relay, 49.09 to 49.16. Inches behind that battle, the Fairview boys were third in 49.96. The final distance event of the meet was the 800-meter run. In the girls' event Fairview seventh-grader Jocelyn Foust ran a winning 2:43.06. Foust brought two years of cross-country running experience to the race, and so did Montford seventh-graderr Ella Grace Hodges, runner-up in the 800 with a 2:49.10. After her second-place finish in the 1600, Leah Holman of Deerlake inched past Cobb seventh-grader Emma Chesire to take third, 2:50.82 to 2:50.90. Eighth-grader Amarie Moore, number one on the Raa cross-country squad during most of the 2016 season, won the boys' 800-meter run in 2:19.34. Swift Creek eighth-grader David Monroe, another cross-country veteran, placed second in 2:24.44. Trevon Riles, a Nims eighth-grader, took third in 2:26.68. Returning to the sprints, the next event was the 200-meter dash. In the girls' race, Fairview eighth-grader Miahna Harden left the field far behind, winning the race in 25.85. Griffin seventh-grader Anaya Thompson took second in 28.78. Keoni Knight of Deerlake added a third place 200 finish to her third place 100 finish, running 28.92 in the 200. In the boys' race, Swift Creek's Galen Johnson had a successful 100-200 double, winning the latter race in 22.95. Montford eighth-grader Dominic Larry was second in the boys' 200 in 24.53, and J'lan Lamb of Griffin took third in 25.39. The final relay as well as the final event on the track was the 4 x 400. Fairview edged Griffin for the top spot in the girls' relay, 4:41.78 to 4.43.32. The Montford girls were third in 4:54.75. On the boys' side, Nims went 4:06.23 in the first section, but Raa answered with a 4:05.11 in the second section, taking first. The Fairview boys, also running in the second section of the relay, took third in 4:14.36. Not all the action was on the track. In the girls' high jump, 100-meter-dash champion Khori Lewis leaped 4' 10" to add a win in the field events to her honors. Leah Holman, who had placed in the 1600 and the 800, was second with a mark of 4' 6". Nims eighth-grader Ja'Mecia Thomas ran for Nims in the 200, but she scored points for her school in the high jump, clearing 4' 4". Nims eighth-grader Toby Carr-McFadden tied for first with Darrien Lawrence of Fairview in the boys' high jump, both athletes going 5' 2". Eighth-graders Martavious Williams of Raa and David Monroe of Swift Creek each cleared 5' 0", tying for third. Nims eighth-grader Zahnevia Polyarpe narrowly prevailed over Nims seventh-grader Kezia Young in the girls shot put, 34' 6-1/2" to34' 5". Raa eighth-grader Aolani Toussaint was third with a mark of 28' 7". Nims eighth-grader X'Zavion Michael won the boys shot with a toss of 45' 2". Cobb eighth-grader Khamari Brown was second at 42' 2", and Xavier Young of Raa sent the sphere 41' 4-3/4" for third. Girls' 200-meter winner Miahna Harden also won the long jump for Fairview, leaping 15' 4". Another Fairview athlete, sixth-grader Alexandria Kennedy, went 14' 2" for second in the girls' long jump after placing fifth in the 800 with a 2:52.50. Raa eighth-grader Naveyh Frost jumped 14' 1" for third. Savion Knight may have been runner-up in the boys' 100-meter dash, but the Deerlake athlete was first in the boys' long jump with a mark of 19' 9". Nims eighth-grader Jordan Nelloms, fifth in the hundred, was second in the long jump at 18' 4". Rajauhn Sancho of Swift Creek, the runner-up in the boys' 400, was third in the long jump at 18' 1". Swift Creek won the boys' team title, scoring 83-1/2 points. The Nims boys were second with 73-1/2 and Fairview third with 65. The Fairview girls won their division with 103 points, while Deerlake was second in the girls' standings with 73 and Montford third with 55-1/2. Leon County Schools' middle school track season continues with Meet #2 at Rickards High on Wednesday, 5 April 2017, and Meet #3 at Leon High on Wednesday, 12 April 2017. The season concludes on Wednesday, 19 April 2017, with the Championship Meet at Godby High. Where The Wild Things Run 5K Trail Race. 8:00 AM ET. WAFT Studios, 215 WAFT Hill Lane, Valdosta, Georgia 31602. Entry form and flyer. Online registration at RunSignUp.com. Fort Rucker Ribbon Run 5K. 9:00 AM CT. Fort Rucker Physical Fitness Center, Building 4605 Andrews Avenue, Fort Rucker, Alabama 36362. Event web page. 5th annual Minuteman 5K Trail Race. 8:00 AM CT. Westgate Park Tennis Center, 801 Recreation Road, Dothan, Alabama 36303. Event page on Facebook. Robert Kelly, robert.kelly.7@us.af.mil or 334-340-8643. 4th annual Book It 5K. 9:00 AM ET. Florida State University Integration Statue, 75 North Woodward Avenue, Tallahassee, Florida. 2016 story. 2015 story. Event profile on Facebook. Online registration at EventBrite.com. Phi Delta Theta's Trent Taylor 5K. 10:30 AM ET. Cascades Park, 1001 South Gadsden Street, Tallahassee, Florida 32301. Event page on Facebook. 4th annual Coach Post 10K, 5K, and one-mile fun run. 7:30 AM CT 10K / 7:45 AM CT 5K / 8:45 AM CT one mile. St. Andrews State Park, 4607 State Park Lane, Panama City, Florida 32408. 2016 story. 2015 story. Event profile on Facebook. Online registration at active.com. 3rd annual Camp Kesem Florida State 5K. 9:00 AM ET. Florida State University Integration Statue, 75 North Woodward Avenue, Tallahassee, Florida. Event page on Facebook. Run for the Ranch 10K, 5K, and one-mile fun run. 9:15 AM ET 10K and 5K / 9:30 AM ET one mile. 25 1st Street SE, Moultrie, Georgia 31776. Entry form and flyer. Online registration at RunSignUp.com. Building on Faith 10K, 5K, and one-mile fun run. 8:30 AM ET one mile / 9:00 AM ET 10K and 5K. Unity Baptist Church, 101 East Bryant Drive, Sylvester, Georgia 31791. Online registration at RunSignUp.com. 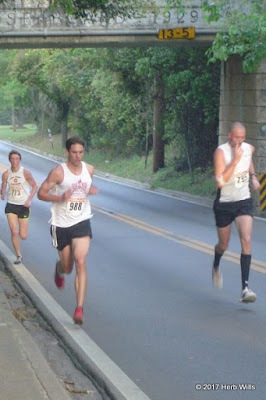 Mayhaw Festival 5K and one-mile fun run. 8:00 AM ET. Colquitt-Miller County Chamber of Commerce, 320 East College Street, Colquitt, Georgia 39837. Entry form and flyer. Online registration at active.com. Colquitt-Miller County Chamber of Commerce, cmccoc@bellsouth.net or 229-758-2400. 50th annual Easter Beach Run Four Mile. 12:00 Noon ET Four Mile / 1:15 PM ET Two Mile / 2:00 PM ET Kids' races. 70 Boardwalk (next to Bubba Gump Shrimp), Daytona Beach, Florida. Event web site. Event profile on Facebook. Event page on Facebook. Online registration at RunSignUp.com. 6th annual Ronald McDonald House Red Shoe Run 10K, 5K, and one-mile fun run. 8:00 AM ET one mile / 8:30 AM ET 10K and 5K. Southwood Capital Office Complex, Esplanade Way, Tallahassee, Florida. 2016 story. 2015 story. 2014 story. 2012 story. Colin P. Kelly 5K and one-mile fun run. 8:00 AM ET 5K / 9:00 AM ET one mile. Colin P. Kelly Fitness Center, Building 12, 325 NW Turner Davis Drive, North Florida Community College, Madison, Florida 32340. 2016 story. Event web page. Entry form and flyer. Tyler Coody coodyt@nfcc.edu or 850-973-1639. Saint Andrew Bay Center 5K and one-mile fun run. 8:00 AM CT one mile / 8:30 AM CT 5K. Leslie Porter Wayside Park, 200 Michigan Avenue, Lynn Haven, Florida, 32444. Event web page. Event page on Facebook. Online registration at active.com. Presidential 5K. 9:00 AM ET. Florida State University Integration Statue, 75 North Woodward Avenue, Tallahassee, Florida. Event page on Facebook. Online registration at tilt.com. 4th annual Nene Fest 5K and one-mile fun run. 8:00 AM ET 5K / 9:00 AM ET one mile. Optimist Park, East Indianhead Drive, Tallahassee, Florida. 2015 story. 2014 story. USATF certified course FL06045DL. Event page on Facebook. Online registration at EventBrite.com. 3rd annual Julep Jog 5K and one-mile fun run. 8:00 AM ET 5K / 9:00 AM ET one mile. Valwood School, 4380 Old US HWY 41, Hahira, Georgia 31632. 2016 story. 2015 story. Entry form and flyer. Online registration at RunSignUp.com. 3rd annual Bulldog Dash 5K and one-mile fun run. 8:30 AM ET 5K / 9:30 AM ET one mile. MacIntyre Park Middle School, 117 Glenwood Drive, Thomasville, Georgia 31792. 2016 story. 2015 story. Event web site. Event page on Facebook. Entry form and flyer. Online registration at EventBrite.com. 30th annual Gnat Days 5K. 7:00 PM ET. Courthouse Square, Camilla, Georgia. 2016 story. 2015 story. 2014 story. 2013 story. 2012 story. 2011 story. Jennifer Burnum, jennifer@camillageorgia.com or 229-336-5255. 36th annual Navy Copper Collar 5K. 8:00 AM CT. Naval Diving and Salvage Training Center, 350 South Crag Road, Panama City, Florida 32407. Event page on Facebook. Online registration at RunSignUp.com. Fort Rucker Surivors and Fallen Heroes 5K. 8:00 AM CT. Lake Tholocco, Fort Rucker, Alabama 36362. Event web page. Salute The Wounded 5K. 7:30 AM CT. Marianna Municipal Airport, Marianna, Florida 32446. Event profile on Facebook. Online registration at active.com. 4th annual Run 2-1-1 10K, 5K, and one-mile fun run. 8:00 AM ET one mile / 8:30 AM ET 10K & 5K. Southwood Town Center, Merchants Row Boulevard at Four Oaks Boulevard, Tallahassee, Florida. 2015 story. 2014 story. USATF certified 10K course FL16013EBM. USATF certified 5K course FL16012EBM. 6th annual Anchors Away 6K and one-mile fun run. 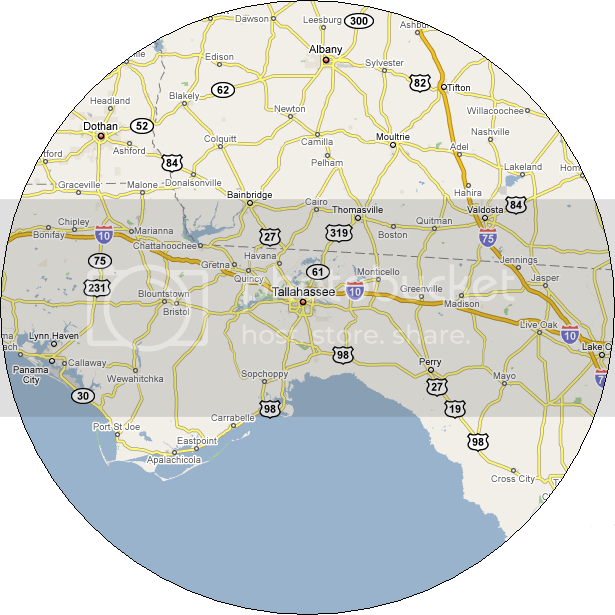 8:00 AM CT. Gayle's Trails - Panama City Beach Conservation Park, Griffin Boulevard, Panama City Beach, Florida 32413. 2016 story. 2015 story. 2014 story. Event page on Facebook. Online registration at active.com. 5th annual Home Run 5K and one-mile fun run. 7:45 AM ET one mile / 8:00 AM ET 5K. Americus First United Methodist Church, 200 South Lee Street, Americus, Georgia 31709. 2016 story. 2015 story. 2014 story. Event web page. Entry form and flyer. Saint Peter's Anglican Church 10K and one-mile fun run. 7:30 AM ET 10K / 7:45 AM ET one-mile. Saint Peter's Anglican Church, 4784 Thomasville Road (US 319), Tallahassee, Florida 32309. Online registration at EventBrite.com. Monticello Kiwanis' 39th annual Melon Run 5K. 8:15 AM ET. First United Methodist Church Family Ministry Center, 325 West Walnut Street, Monticello, Florida 32344. 2016 story. 2015 story. 2014 story. 2013 story. 2012 story. 2011 story. story. 2010 story. USATF certified course #FL06044DL. Entry form and flyer. Fort Rucker Triathlon (.25-mile swim, 10.6-mile cycle, 3.1-mile run). 7:00 AM CT. West Beach, Lake Tholocco, Fort Rucker, Alabama 36362. Event web page. 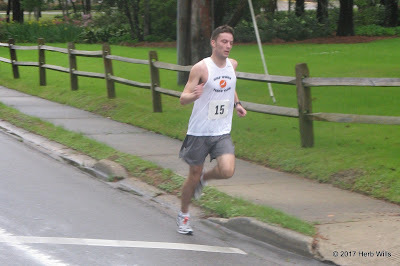 Fire Ant Festival 5K and one-mile fun run. 8:00 AM ET. Turner County Specialty School, 330 Gilmore Street, Ashburn, Georgia 31714. 2017 story. 2016 story. 2015 story. 2014 story. 2013 story. 2011 story. Festival website. Online registration at EventBrite.com. Entry form and flyer. Eilene Perry, eileneperry@yahoo.com or 229-392-2563.